Happy Day to all Mothers! A Mother’s Day Road Trip to Vancouver Island. My Mum is an amazing lady, and I decided this year to have a whirlwind trip for the day, doing things we have always wanted to do, just the two of us. 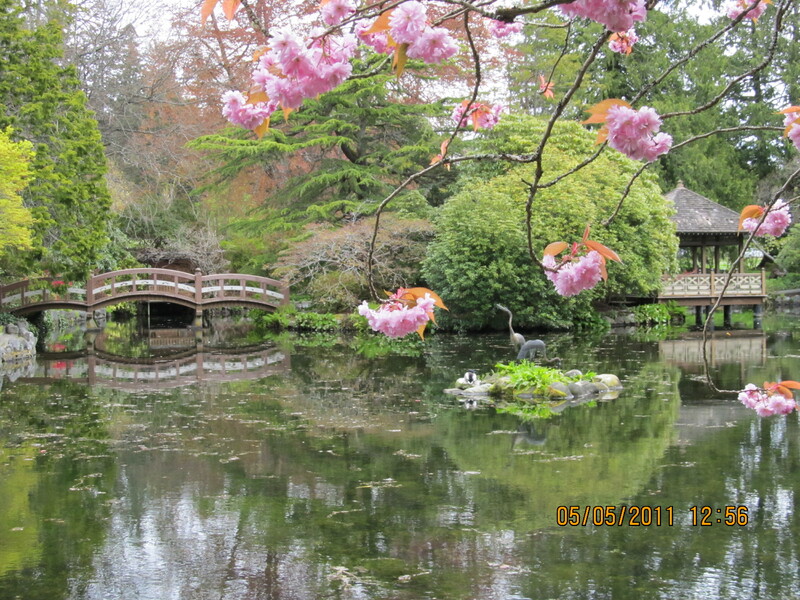 First stop after a 90 minute ride on the BC Ferries, 100 year old Hatley Castle Gardens. 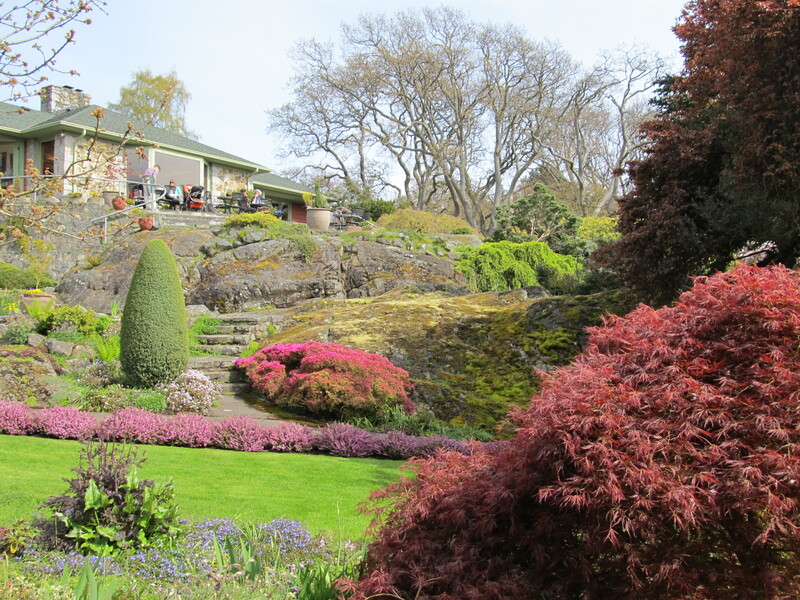 Known for its 250 year old Douglas Firs, Italian Garden, Rose Garden and Japanese Garden, it is located on the Juan de Fuca Straight and is on Sooke Road approximately 20 minutes from downtown Victoria. Springtime is the perfect time to tour beautiful gardens such as this, with the early flowering blooms, buds opening on trees, and sweet floral fragrance in the air. 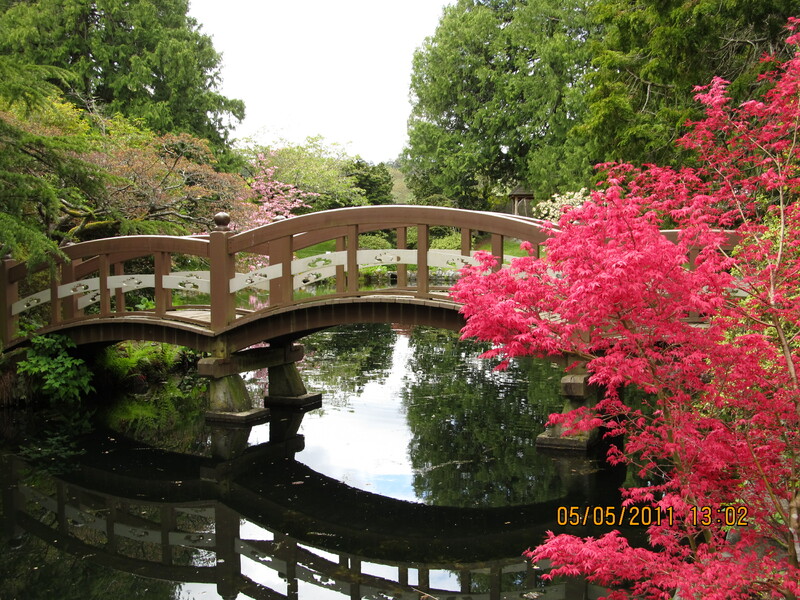 This bridge is a feature in the Japanese garden, filled with many varieties of Japanese maples such as this one with vibrant red new growth. 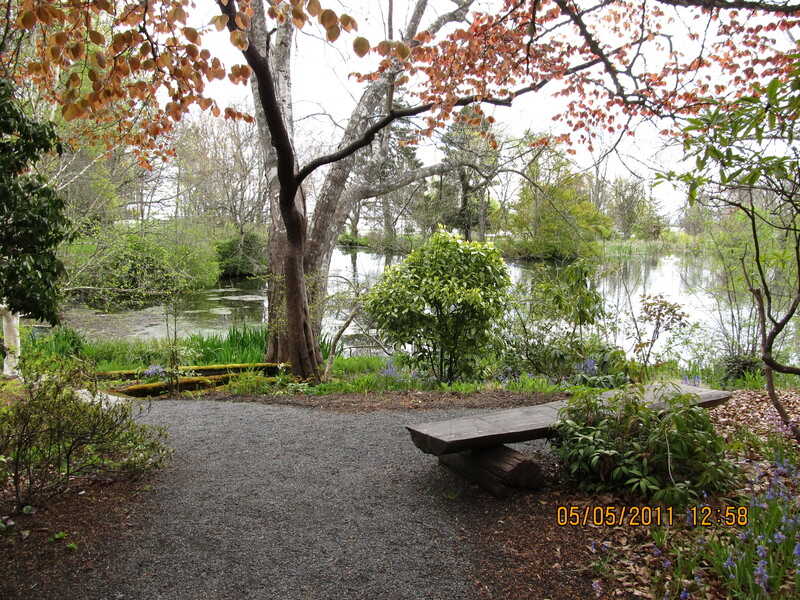 A quiet resting spot under the canopy of mature trees next to the bog garden. My Wee Scottish Mum was very excited by the abundance of naturalized bluebells in the woodland forest. 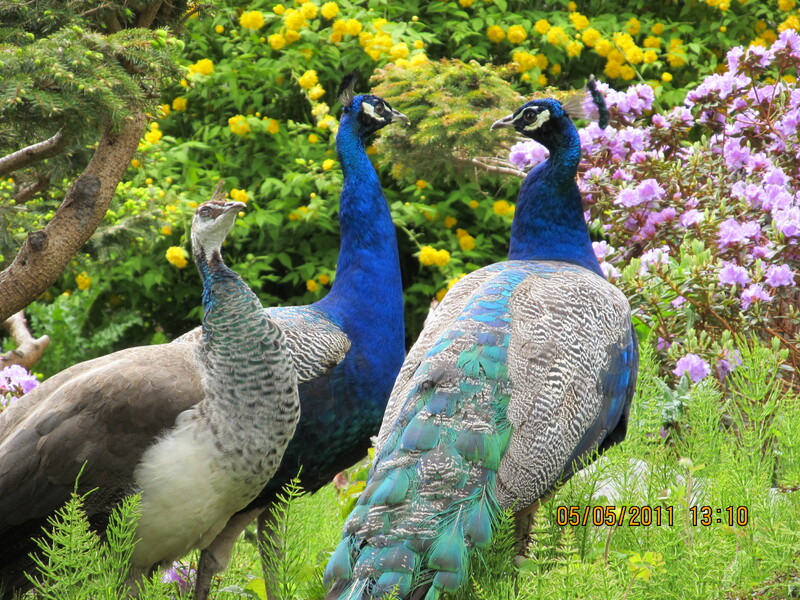 Even the majestic peacocks came out for a visit. I would love to return for a visit in summer to see the rose garden in bloom. 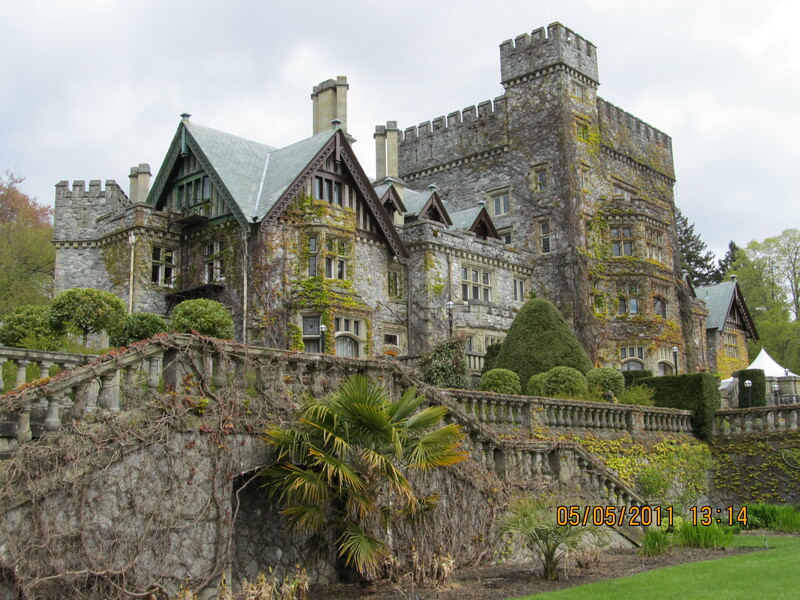 Hatley Castle was originally built by former BC Premier and Lieutenant Governor James Dunsmuir as his residence. The gardens designers were from Boston Mass. 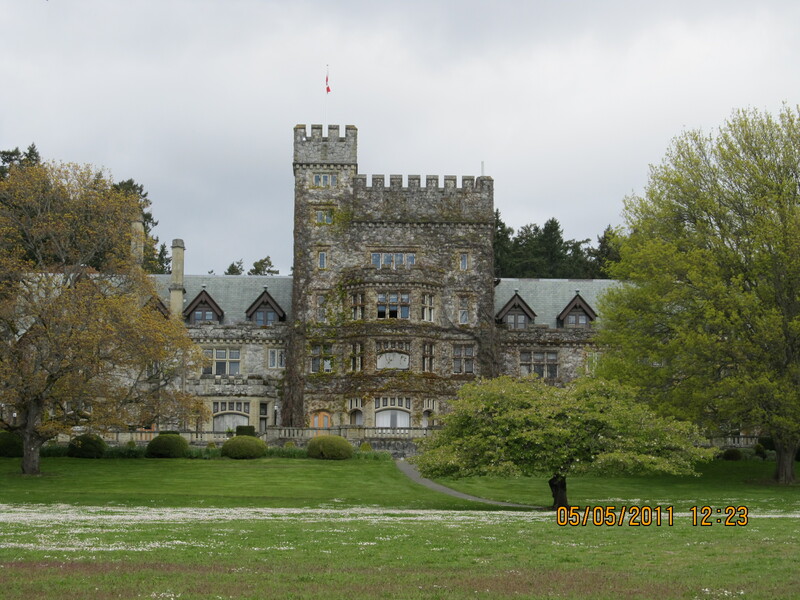 Hatley Castle became the Administration building for Royal Roads Univerisity in 1995 after many years as Royal Roads Naval College and Military College. Scotsman Robert Dunsmuir, this Province’s wealthiest man in his time and James father, built Victoria’s Craigdarroch Castle which is now a historical site. 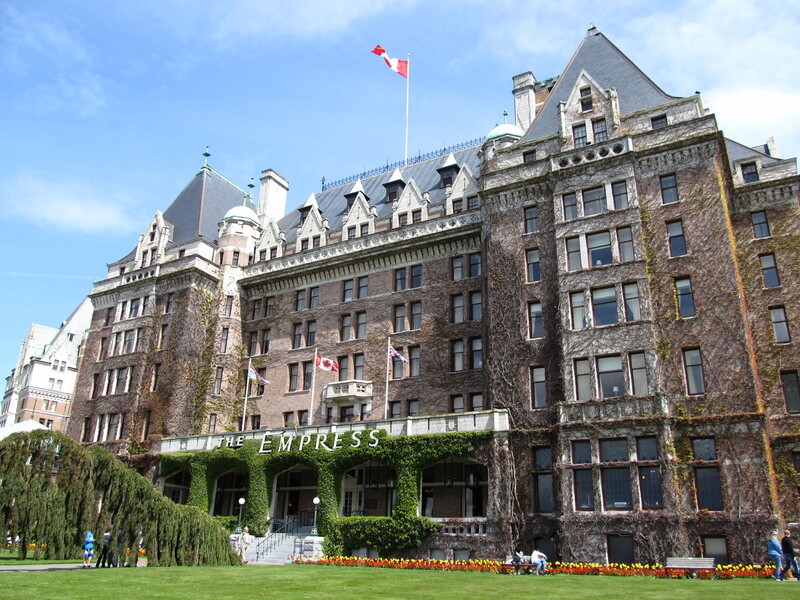 Built at the turn of the century, the Empress Hotel is a landmark of the Victoria inner harbour. 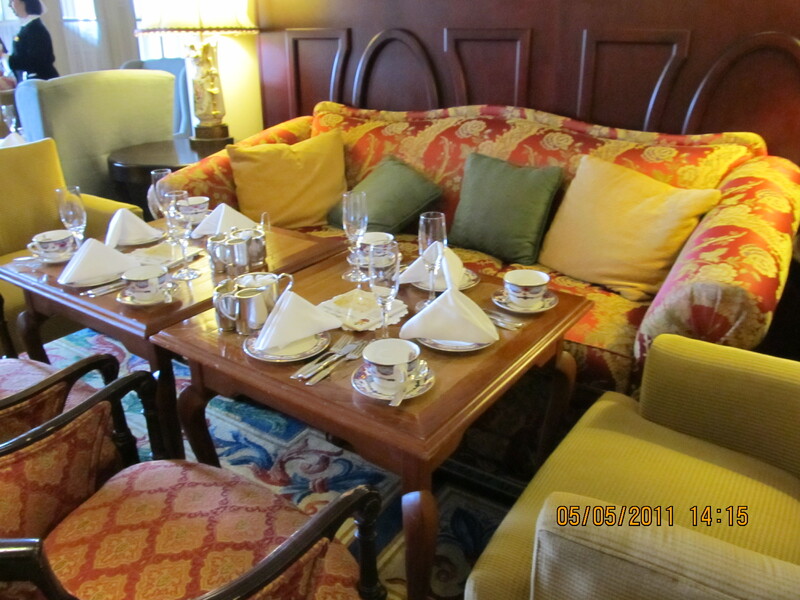 Serving afternoon tea has been a tradition for over 90 years. The Tea Room is grand and traditional, and we had this lovely table by the window with a view to the harbour, and the other Victoria landmark, The BC Parliment buildings. 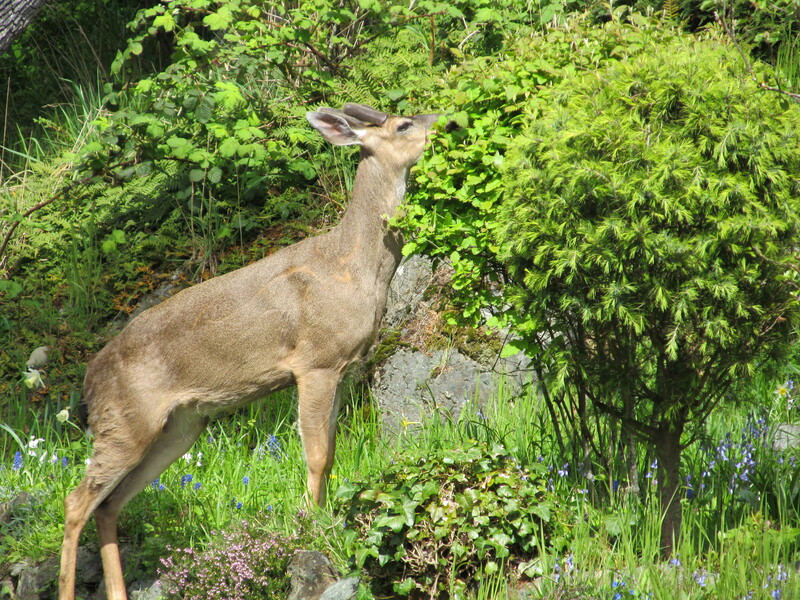 En route to our next stop, we happened by a young hungry deer in a front yard of a home. 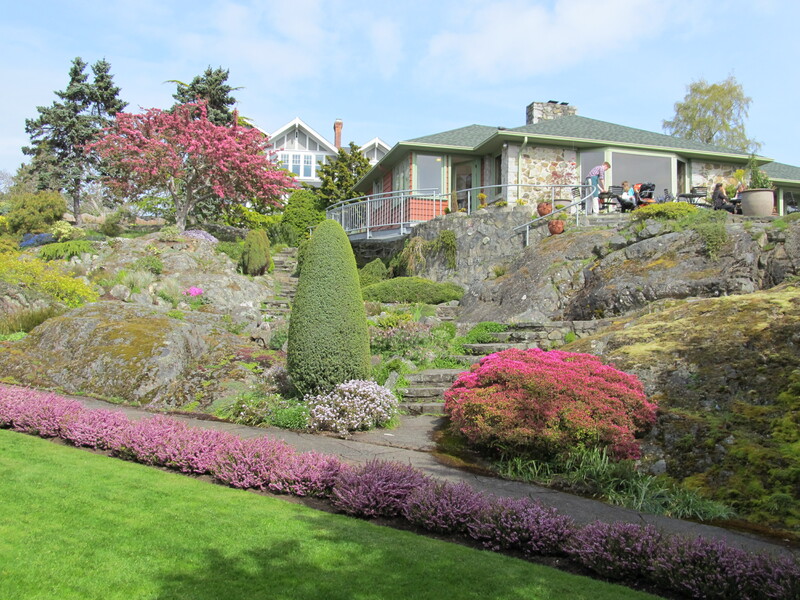 A labour of love for 4o years, and a wonderful love story of hope are the history of the Abkhazi Gardens. 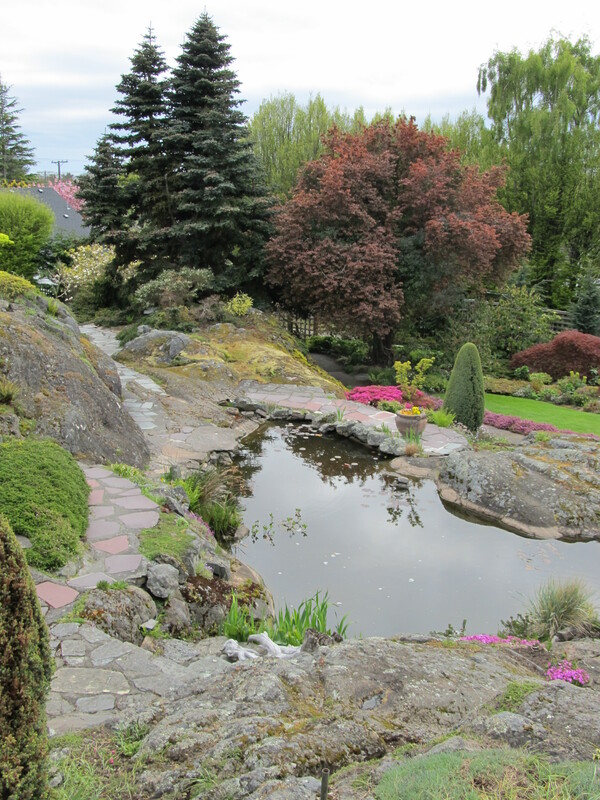 Saved by the BC Land Conservancy in 2000, this garden is a gem worth visiting and is 10 minutes from Victoria Inner Harbour. Hidden from the street, it feels like entering a secret garden. 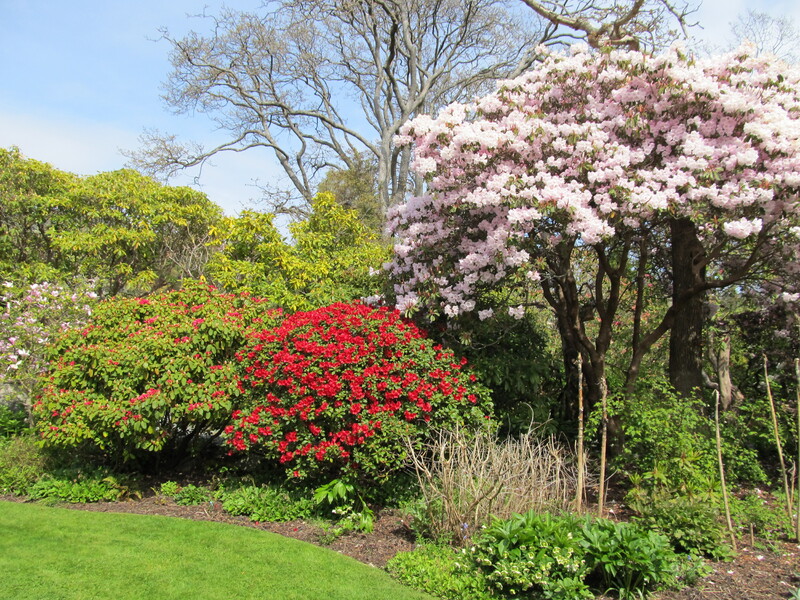 1oo year old Rhododendrons are at beginning of your stroll through the peaceful woodland garden. 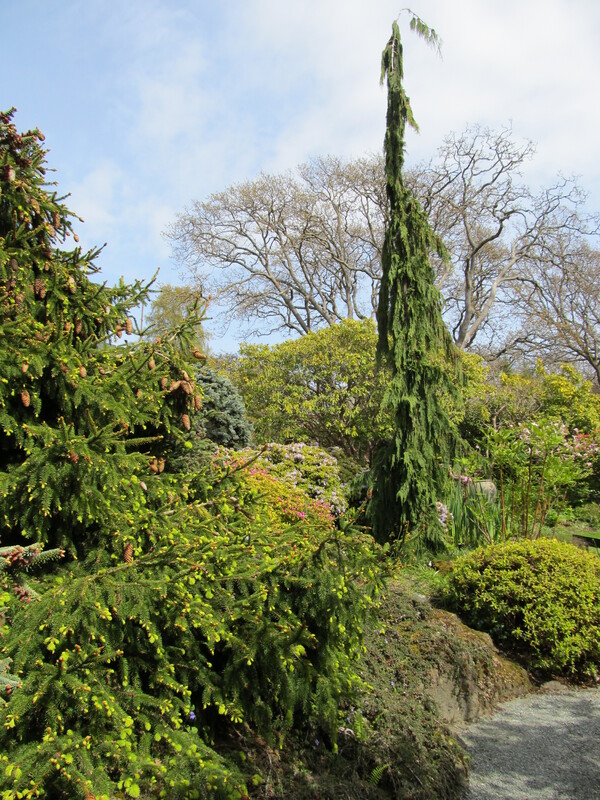 Sculptural trees are a feature throughout the garden. 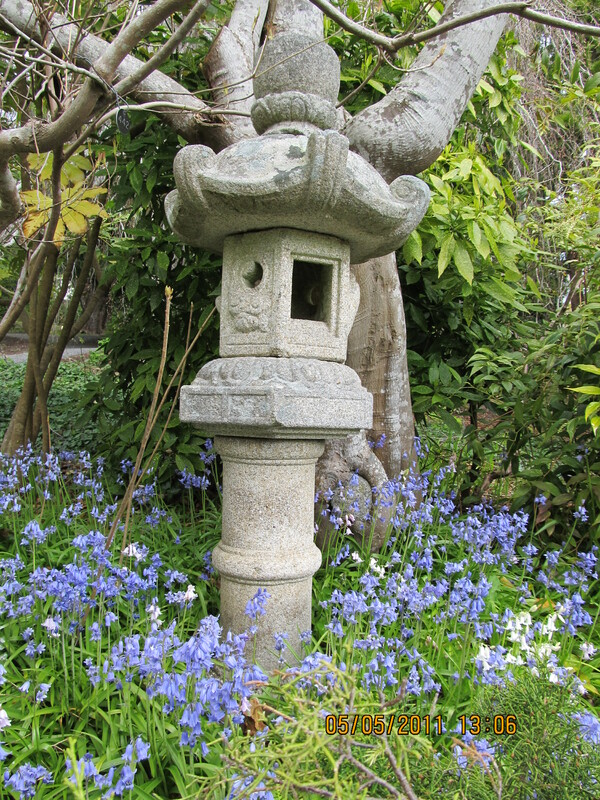 Peggy had lived in Shanghai which strongly influenced the garden. Marjorie (Peggy)Pemberton-Carter met an exciled Prince Nicholas Abkhazi in 1920’s Paris. Both were WWII prisoners of war and did not know for many years that the other had survived. Peggy purchased this 1 acre land with the glacial rock in 1946 and began its transformation to what you find today. They reconnected and Nicholas joined Peggy in Victoria where they were married and lived the rest of their lives. Mid Century Modern lovers will appreciate that this post war home was designed by a young architect that had worked in the offices of L.A. modernist Richard Neutra, by the name of John Wade. 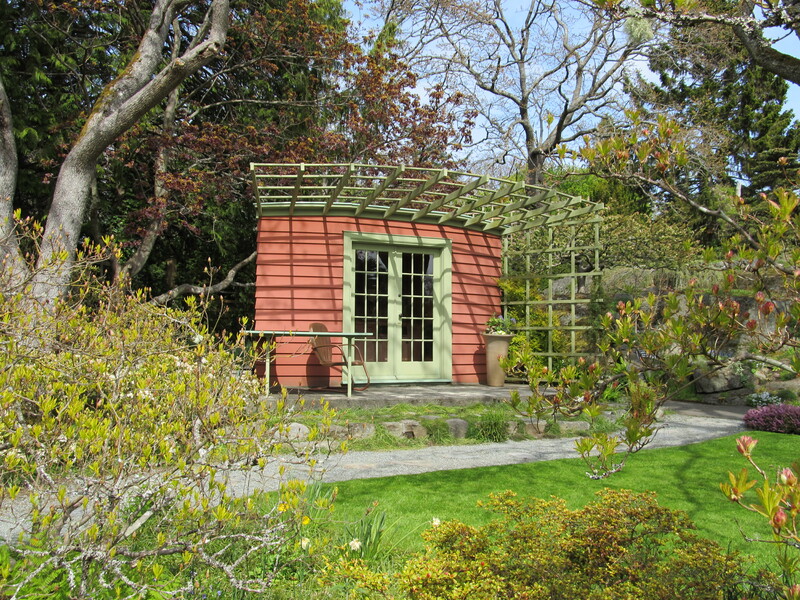 Peggy originally hired him to design the Summerhouse. Summerhouse is a charming focal point at one end of the garden, and provided a spot for lunch while planning and working the garden as well as a different viewpoint to enjoy the garden from. This hidden pond in a natural valley of the rock is home to fish and turtles and is only visable from the house terrace and upper path. Spectacular views from the terrace to the ocean in the distance. 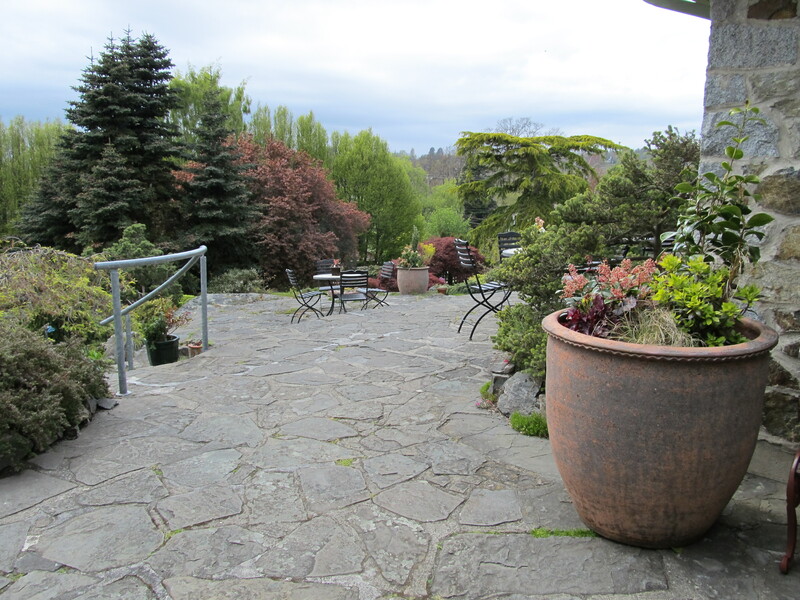 The terrace is lovely place to stop for lunch and there is a restaurant in the house. The garden feels much larger as a result of the great borrowed view – the property lines are invisible through much of the garden, so neighbouring trees and shrubs feel part of this property, an extension of it and part of the genius of its design. It was wonderful to see a castle garden that at one time was cared for by 120 gardeners in contrast to the intimate, private garden cared for extensively by two people. Looks like you and your wee Scottish Mum must have a lovely day, despite the ferry problems! Lovely pictures, as usual! Thank you so much for visiting The Land Conservancy’s Abkhazi Garden on Mother’s Day. Your photos were beautiful and we love how you weaved the story of the Abkhazis, with the wonderful features of the garden. 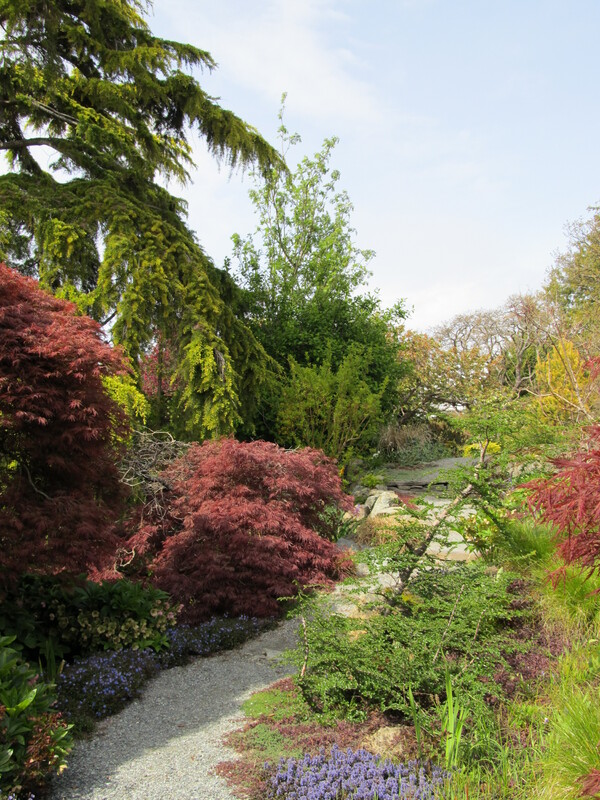 We are very grateful to have this amazing garden under our care. Stop by again soon!